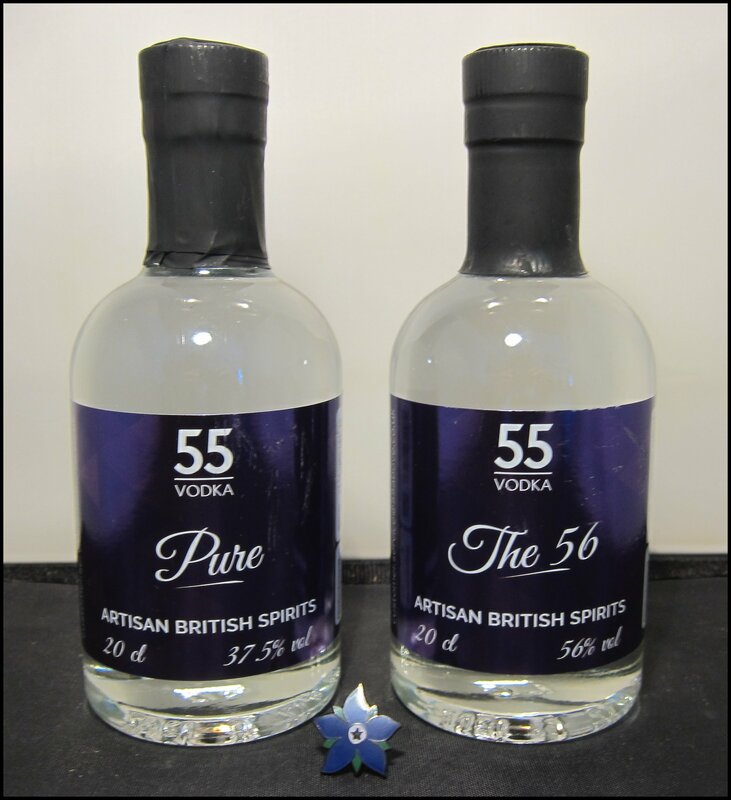 55 Vodka is a new vodka distillery located in Lynton and comes at a time when there is a renaissance in British distilleries, but many of these focus on making gin and eventually whisky and usually work with grain spirit. 55 Vodka is different in that they currently only make vodka and they make it from potatoes. The distillery opened in 2014 and make a range of unflavoured and flavoured vodkas. The latter include: coconut, pineapple (both of these use a maceration of the actual fruit/nut to add flavour), and toffee (this is made using toffee in syrup form). All are free from artificial colours and flavours. Whilst this article will feature on the unflavoured spirits, it is great to see some British distillers leading the fight back against the wave of bizarrely-flavoured (and what is worse, poor quality) flavoured vodkas. Their flagship vodka, made with 100% potatoes. Nose: Clean, with a touch of juicy citrus blossom and apple. Taste: This has a good texture: the vodka fills the mouth and the texture is initially smooth, but has a little warmth and a touch of residual pepper heat. It is easy to sip, with some fruity notes as well as cracked black pepper and cubeb, with the addition of vanilla on the finish. With ice, the vodka is soft, but still has character, with a light creaminess and slight berry fruitiness that makes me think of a mix of strawberries and raspberries and cream. A clean and soft Martini with a good freshness to it. Despite the % ABV, lots of flavour still comes through and the drink is far from weak or bland. A well mixed and integrated drink that chills down really well. There are hints of cream and red berries. This is a really lovely drink and clear proof that a Martini does not have to use extra-strength alcohol. This makes quite a fruity tonic serve, with a little sweetness, too. A wedge of fresh lime offsets this sweetness really nicely, creating a fresh and lightly tart thirst-quencher. This is 55 Above’s high-strength vodka, also made with 100% potatoes. Nose: An exciting mix of fresh salad leaves and peeled stone fruit. There’s a suggestion of sweetness, but – overall – it appears dry. Taste: There is a dry complexity upfront, which reminds me a little of some Lowland Scotches, plus lots of dry fruit – perhaps cherry or apricot – but there is very little sweetness at all, save for a little vanilla spice toward the finish. Exceptionally smooth for a 56% spirit, this is very sippable with a warm glow that builds towards the end. Excellent: dry fruit notes come through, which start to remind me of dry vermouth or a high-end Soju. There is a still a little spice and creaminess, but it is really toned down. Given the complexity of this serve, it could make a good alternative to whisky on the rocks. A very silky texture, with plenty of flavour. The fruitiness is a little more curbed, although hints of apple and slightly tart stone fruit still come through, making this very enjoyable and particularly smooth for the ABV. Absolutely superb. The vodka is smooth on its own and, when stirred, this character really comes through. The vermouth adds a little complexity and works well with the spirit’s fruitiness. Another very smooth drink, with lots of complexity, too. There are dry stone fruit notes as well as a little herbal complexity, with just a touch of lemon and thyme. No garnish is needed, but a twist of citrus peel adds yet another dimension. I am very impressed with both spirits. It’s not easy to distill from scratch with potato, but 55 Above have certainly managed it. The 37.5% was very good and had plenty of character, making it versatile for mixing. I was particularly impressed with the 56%, partly because a potato vodka over 40% ABV is rare thing (I know of only one outside of Norway), but mostly because it is a great spirit with excellent complexity that remains amazingly smooth. When I first went to the Sipsmith Distillery (October 2010), they had released two products: a gin and a vodka. Their gin has gone from strength-to-strength and is now available in the USA. Back then, the vodka was barley-based, like their gin, and had an indulgent flavour of cream and vanilla. Fast forward to 2014, and Sipsmith have just released a wheat-based “Sipping Vodka”. This comes at a time when more spirits are being marketed, at least in part, as being just as tasty on their own as when mixed. As such, I tried the vodka neat at a variety of temperatures. Nose: Light and clean, with some light spice and a hint of vanilla, as well as toasted cereal. Taste: A rich and viscous texture, this is a clean spirit with notable character from the base. There are also notes of spice, including anise and fennel, before a little warmth on the finish. At a lower temperature, the spirit changes flavour with richer, slightly jammy, fruity notes, as well as an increase in warmth and spice, too. Drinking straight from the freezer produces a very pure and clean flavour, as if it were from a crystal-clear shard of ice. This is a pleasant way to enjoy the spirit, with a great texture and a light character. Thick in texture and pure in taste, although, as a result, some of the flavour is slightly curbed, replated with a little more creaminess comes through. Very, very clean – almost water-like. Superb – truly textbook: clean, crisp, and smooth with residual character. This is equally good with a lemon twist or an olive, although my preference would be for the former. This is a great drink with a lovely crispness and power from the alcohol, whilst still being easy to sip for simple refreshment. Whilst, as I mentioned I was a fan of old Sipsmith’s Barley Vodka, I think the Sipping Vodka is a great addition to the range and it more complex and sippable (funny that) than many other vodkas. Sipsmith Sipping Vodka reaches the pleasant balance between smoothness and drinkability and character. I liked it chilled and neat but was also very impressed with the vodka tonic. Sipsmith Sipping Vodka (40.0%ABV) is available for around £29 for 70cl from The Whisky Exchange. A few weeks ago, I received an interesting e-mail from Niederegger Marzipan, advertising a game for Halloween (see below). 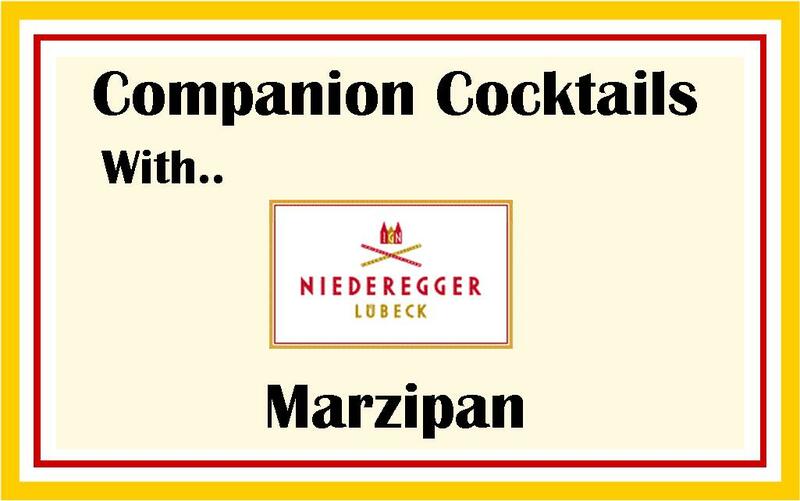 I thought I’d take the opportunity to match some of the chocolate-covered marzipan from their Klassiker Range, which mixes liquors and marzipan, with some cocktails. I wanted to create a cocktail to complement each of the four flavours, whilst also giving the cocktails a somewhat autumnal twist; and no, there will be no Amaretto – that is just too easy. Niederegger confectioners have been making tasty treats since 1806 in the German city of Lübeck. Today, they make a wide range of fine treats, including a host of different marzipans and nougats. Quite dry, given the Calvados and Champagne, with the red vermouth adding some herbal notes and, along with the sugar cube, some sweetness for balance. 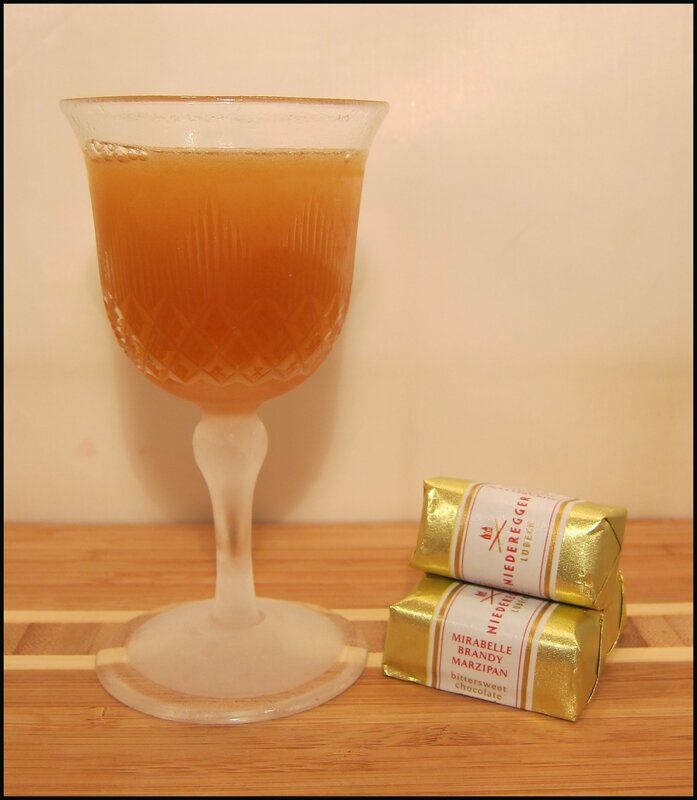 The fresh, fruity and sweet apple of the chocolate complements the dryer cocktail. 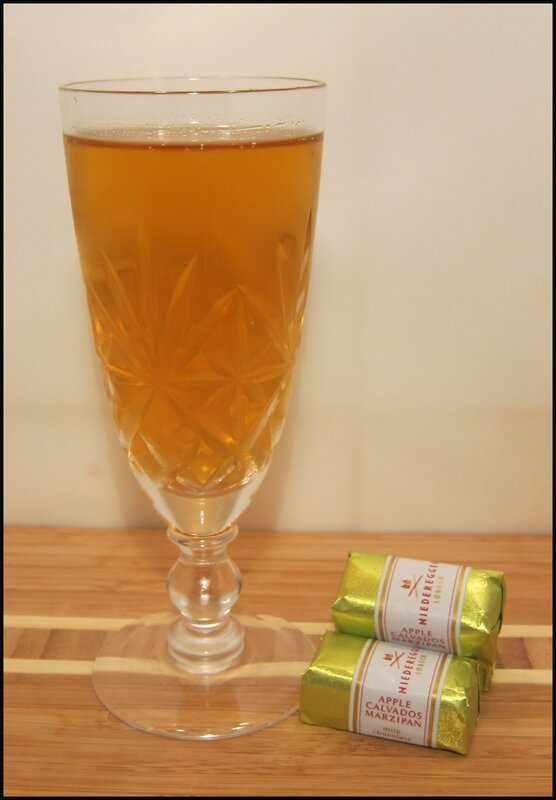 Additionally, the marzipan’s smooth texture contrasts pleasantly with the intense bubbles of the Champagne. #2) Port & Starboard with Vodka and Port, accompanied by Vodka & Fig Marzipan. A relatively tart drink with some deep, fruity, jammy notes from the port. If it’s a bit too tart, try adding a little sugar and stir. The marzipan has a lot more texture than the previous one, being almost crunchy, and is rich and sweet, going well with the tart dryness of the cocktail, which reminds me almost of a rich, dry sherry. Whilst these two might be too bitter/sweet on their own, together, they harmonise. 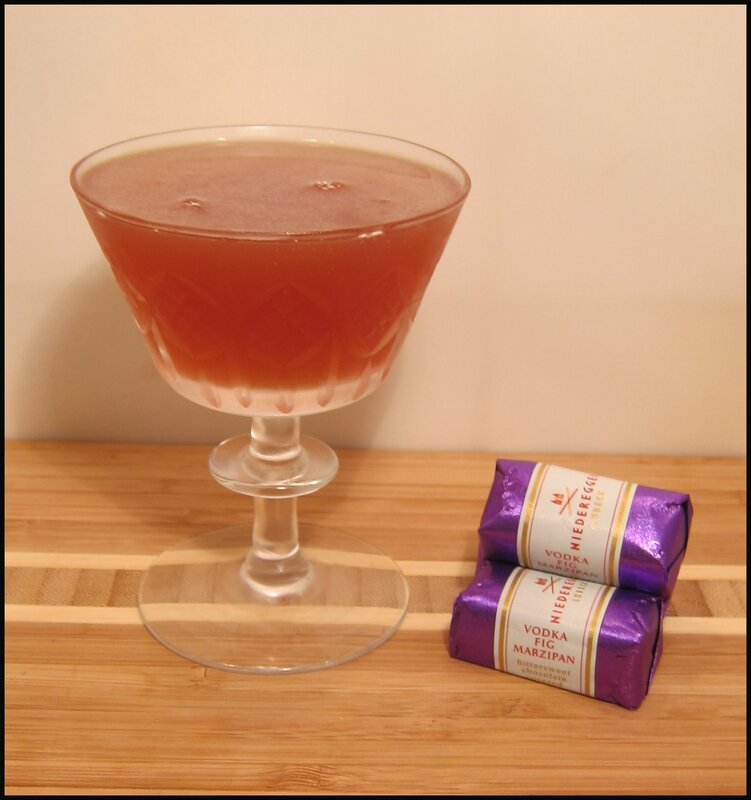 #3) Smoky Rob Roy, with Bowmore Mariner Scotch Whisky, accompanied by Mirabelle Brandy Marzipan. The marzipan is light and more coconutty in texture, with a hint of orange coming through, too. In contrast, the cocktail is stronger in flavour, being very smoky and deliciously refreshing. The orange twist ensures that this pairing go together remarkably well. 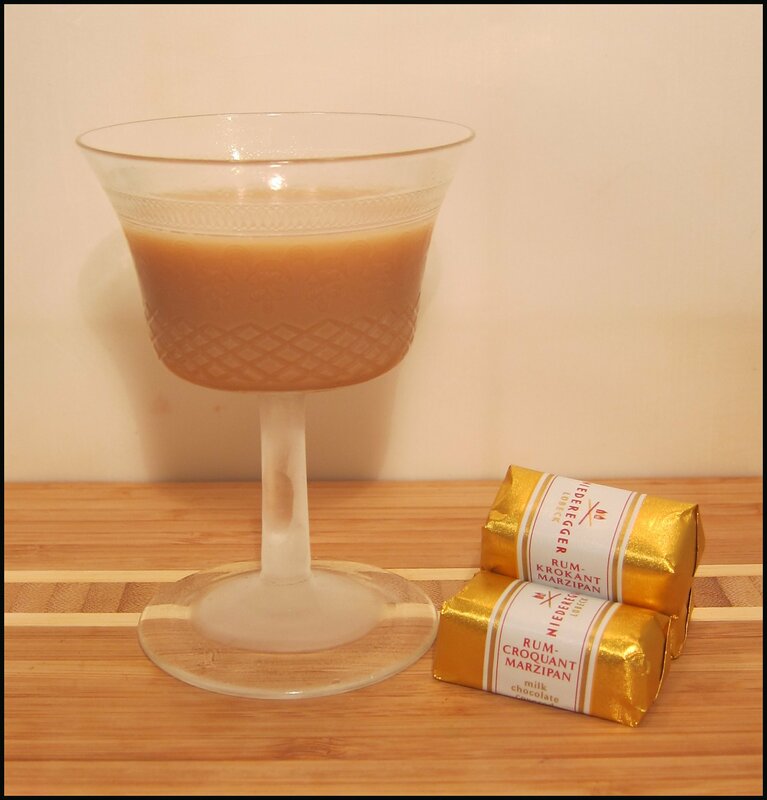 Although you wouldn’t necessarily think that smoky whisky would go well with marzipan, it really does – this is excellent and easily Mrs. B’s favourite. This marzipan tastes richer and weightier than the previous ones, with its sweetness and rum notes coming through strongly. As such, the lighter cocktail is a very good accompaniment, tasting something akin to an adult’s version of chocolate milk. Coincidentally, the use of milk is much preferable to cream in this pairing, as the latter would create a far too heavy, sickly cocktail. As it is, the cocktail carries a lovely hint of rum that continues well into the finish, accompanied by lots of almond. This box of marzipan covers a whole range of interesting flavours, meaning that everyone – who likes marzipan! – should find a favourite in here; fortunately for us, we were evenly split, with Mrs. B. preferring the Vodka & Fig Chocolate and Smoky Rob Roy, and my favourites being the Apple & Calvados Chocolate and the Normandy ‘75. In addition to being delicious on their own, I was impressed at how well they went with cocktails, each of which highlighted the flavours and textures of the sweets and often meant that the flavours lasted for longer. The sweetness of the marzipan also meant that we could experiment with stronger flavours (e.g. bitter or tart) that, when sampled on their own, were less palatable. Teams are formed and, each round, one player from each team dons the blindfold and chooses, at random, a piece of Niederegger. They must then write down what flavour they think they tasted on the team’s cards. This process is repeated through all the flavours that are available, ensuring that each team member has a go. 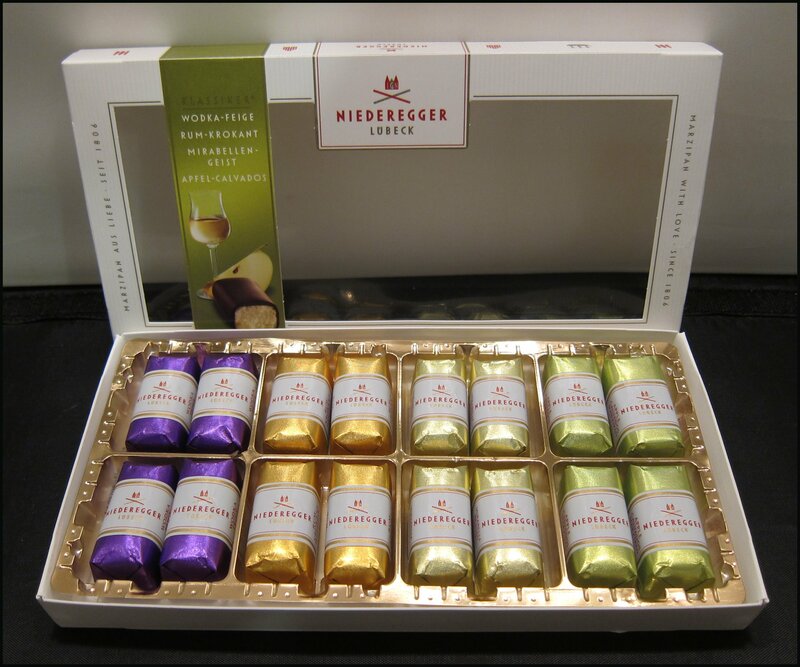 A selection Niederegger Marzipan is available from Amazon, John Lewis, and Lakeland as well as many other shops. 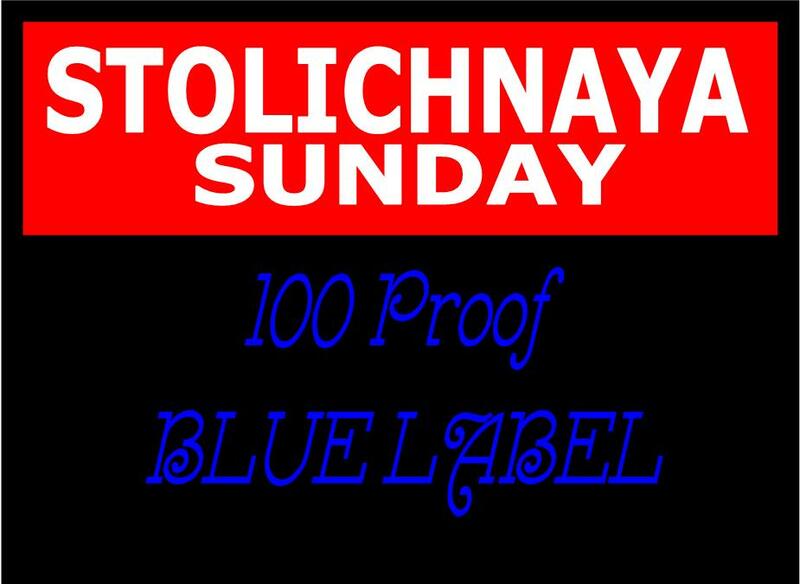 In the second of our Stolichnaya Sundays, we will look at the export variety, their Blue Label. This is essentially the same as the Red Label, but is bottled at 50% ABV. It is interesting that Stolichnaya, like Smirnoff*, bottles their export strength in packaging with a blue label. Nose: Clean and neutral, with a tiny hint of grain. Taste: Initially, very smooth (especially for 50% ABV); the strength only really appears once you have swallowed it. Overall, this is a very clean and neutral vodka; it’s quite easy to drink with some character coming from the grain and bready notes. Taste: This has a rich, thick texture, like syrup; it’s very viscous. Full of flavour and, again, it’s very smooth for a spirit at 50% ABV. There’s a robust warmth, but no real burn. Potent, but excellent. Unusually for Stolichnaya, this drink has quite a neutral flavour. It’s clean and strong, but, beyond that, it’s rather silent in character; given its strength, it’s rather easy-to-drink. I think this could be well-suited to a pre-dinner drink. This makes a clean Vodka Tonic with a hint of vanilla and anise. Strong, but relatively silent; no fuss and easy to drink. Tasty and satisfying. Probably my favourite use for Stolichnaya Blue is in a Vesper as the strength is closer to the strength of alcohol in the 1950s and whilst providing a more potent drink, the cocktail is just as smooth as ever. A very good choice. Stolichnaya Blue is a clean vodka that adds more power to the drink, almost as if it gives the cocktail a backbone for the other ingredients to sit on. My favourite vodka for Vespers. * Smirnoff Export Strength does differ depending on where you buy it: some locations have it at a measly 45% ABV, whilst others at the full 50% ABV. Following the success of Seva’s Seagrams’s Sunday, a series of articles focusing on the gin products of Seagram’s that I published on Sundays, I bring you a new series, this time looking at vodka. Stolichnaya Vodka originates from Moscow and was founded in early 40′s, although a trademark for the name was granted in 1938. By the 50′s, Stolichnaya became known as a vodka of quality, winning various accolades, but it wasn’t until the 1970s that it became widely available in the US, thanks to a reciprocity distribution agreement with Pepsi. 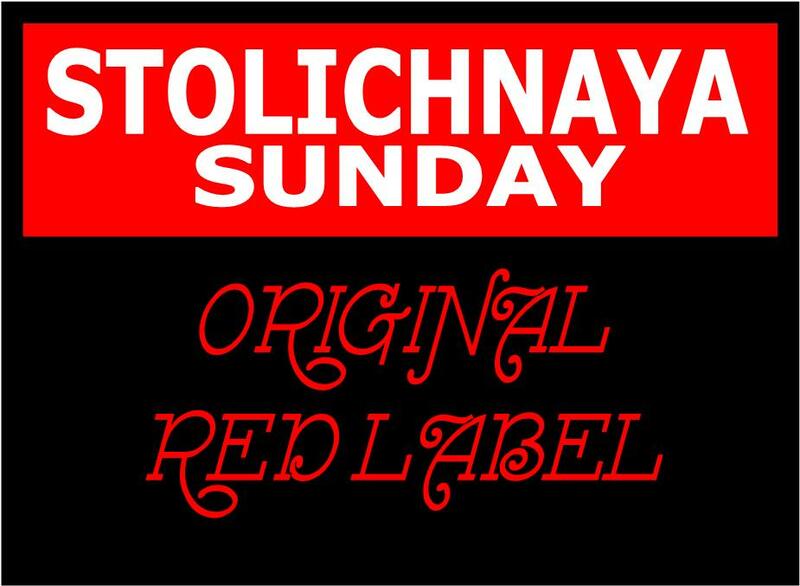 Stolichnaya Red is the “standard” Stolichnaya, which is bottled at 40% ABV. It’s a good all-round vodka that’s excellent for sipping and cocktails alike. Taste: Clean, with some cereal grain flavours. Quite bready with a hint of sweet creaminess at the end. Not spectacular, but sound and very good considering the price. Nose: Grain, with a light, creamy vanilla note. Taste: Relatively smooth with a tingle at the end; very clean, with faint hints of grain and bread, followed by a touch of bitterness. Overall, very good. Very crisp, quite clean, with smooth hints of vanilla, cocoa and coffee. Very cool. A good standard, although not exceptional. Very fresh and very easy to drink. Some of the vodka’s flavours come through, as does its smooth texture. Stolichnaya Red Label is available form grocery stories for around £14 for 70cl. 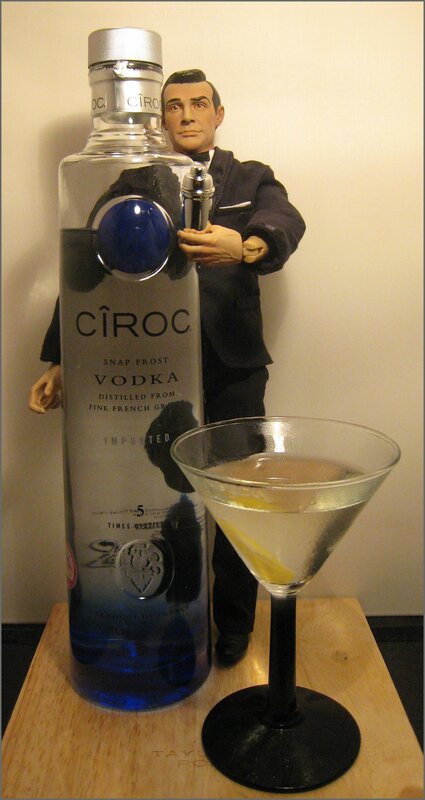 *I have written about the brand for other publications, including this article on the James Bond Martini. 2012 sees the 56th BFI London Film Festival and, for the first time, Cîroc Ultra Premium Vodka will become the Official Spirit of the festival. 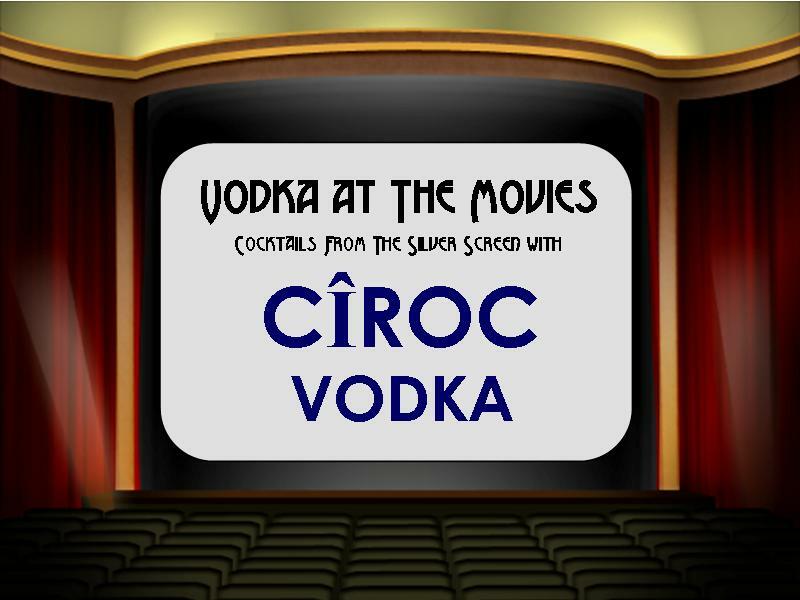 To celebrate the vodka’s patronage of the arts, today’s review will be rather film-orientated, with all of the cocktails having been featured in films. Cîroc Vodka is made in France and unlike most vodkas, which are made from some sort of grain or potato, Cîroc is made using Mauzac Blanc and Ugni Blanc grapes. These two grape spirits are distilled four times each and are then blended together, before being distilled one final time. Clean drink with some citrus almost sherbet lemon elements, refreshing a slice of lime takes away some of the sweetness of the tonic. This made a crisp Martini, but without the edge of those made using some other vodkas. As with the other drinks, Cîroc produced a more mellow, soft and slightly sweeter drink. If you like your Martinis with a bit of bite, then I’d suggest keeping this vodka in the freezer. A Vesper should be clean and crisp and this certainly is but the noticeable difference is the the drink is full, in texture and flavour and little more mellow and laid-back. Really rather good, the trick to a good screwdriver is to use freshly squeezed orange juice, it really makes a difference. Fresh juice works better with the flavour of Cîroc vodka too. Simple but, done right, delicious. This was a good way to enjoy the vodka and I was pleased to find that a little ice-melt and dilution doesn’t really take away from the flavour of the spirit. In fact, a little water actually seems to add some complexity to the taste, including some fruity citrus and spiced vanilla. This was creamy to drink, with some sweetness and bitter coffee notes at the end. The Cîroc gives the drink a clean backdrop, allowing the other flavours to be displayed, with a slightly grainy character and a mellowness you wouldn’t get from a budget spirit. Cîroc vodka is going to be “the red carpet drink of choice” throughout the festival and will also support event, galas and dinner throughout the festival, providing bars and bespoke cocktails. Some bottles of Cîroc will also be wrapped in specially designed artwork from the films, signed by leading talent and then auctioned at a Cîroc Ultra Premium Vodka collaboration charity event with the BFI. This second category has becoming increasingly elaborate either by distilling the spirit icosuple** times or by filtering through a variety of expensive precious metal or stones or even utilising millennia old volcanic rock for the purpose. So it was genuinely refreshing to come across a vodka moving towards the other end of the scale, the vodka remains unfiltered. The vodka in question is the new Belvedere Unfiltered, bottled at 40%ABV this is made using just Single Estate Dankowskie Diamond Rye. This is a baker’s grade rye from Poland and is grown in just a few locations. It is also a patented variety of the crop. The vodka is distilled 4 times. nose: grainy with a hint of salt and a little alkaline. taste: this is still quite smooth with some warmth only at the end. Having tasted it against the classic Belvedere this does have a lot more texture (not just warmth) and flavour too. Grainy, pepper and creamy vanilla. Once swallowed the vodka seems to have a little more numbing effect. Cool tingle and full of character. It is still quite smooth but has a touch more intrigue to the Belvedere Original if it were the rougher more mysterious cousin. Reminds me of some of the best authentic local Russian or Polish vodka I have tried. Tastes rather authentic. Lovely. A good clean Martini but more flavourful than usually with a mix if cereal and vanilla with some cream too. The vodka seems in harmony with vermouth but lacks that cutting “shard of ice” quality that some vodka martini drinkers crave for. Lovely. A really nice drink that has a rustic quality but is still of good quality. Very pleasurable to sip on a Friday evening – as I am now. A pretty flavourful Vodka Tonic with the grainy, bready notes as well as the creamy vanilla working well with the deep earthy bitterness of the tonic water. If you usually find a vodka tonic boring try this. Belvedere Unfiltered bills itself as being “The Whisky Drinker’s Vodka” so how does it live up to the claim. I ask my own in-house whisky fan and vodka sceptic Mrs. B.
Firstly I think it’s great that people to continue to innovate with vodka and for cynics that may think that Unfiltered vodka is “just another gimmick” I must say that it really made a difference. When blind tasting Belvedere Original and Unfiltered it was relatively easy to differentiate the two and, for me, the extra character of the Unfiltered, whilst it retained it’s smooth texture, had the edge for my money.